Get Free Shipping on orders above $25. Hurry Up! Alcohawk Accessories starting at $19.99 only. Hurry Up! 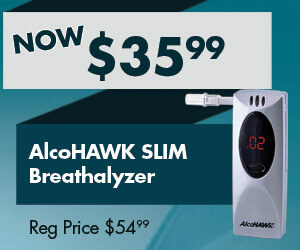 Alcohawk Personal Breathalyzers starting at $49.99 only. Shop Now! Alcohawk Professional Breathalyzer and 50 Free Mouthpieces starting at $179.99 only. AlcoHawk brand of breath alcohol testing monitors in breathalyzers. AlcoHAWK breathalyzers combine cutting-edge technology, simple-to-use formats and a price point for any budget. The product line includes highly accurate fuel-cell sensor technology ideal for law enforcement, hospitals, schools and other professional testing applications, semi-conductor sensors ideal for personal testing and single-use disposable breath alcohol testers. AlcoHAWK breathalyzers provide accurate and instant results. Found a coupon for AlcoHawk?